Ok. So you’ve weighed yourself. Now breathe. This doesn’t mean you’ll have to survive on celery and water the rest of your life. In fact, you’re better off just starting slow and tweaking what you already eat. Because I have a problem. With coffee. And I'm sure I'm not the only one around here. I hate it when stick-thin nutritionists tell you to nix your daily mocha for a cup of green tea. I mean, sure, the green tea is really good for you, but who really wants to drink green tea instead of a mocha? That’s just silly. So here are some ideas of how to cut the fat without cutting the fun. ** You can still have your double-tall-mocha in the morning, just cut the whipped cream. You’ll save 100 calories and 10 grams of fat in just 2 tablespoons! And who has just two tablespoons?! If you get your mocha every weekday, you’ll be saving 2,000 calories and 200 grams of fat in a month – without really doing anything! 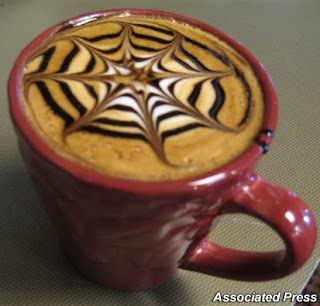 If you think you’ll miss it, just ask the barista to dollop some extra thick foam on top. You might even discover you prefer the sweet, foamy milk over the melting globs of fatty whipping! **Instead of a Grande Mocha Frappuccino at Starbucks, grab a Chocolate Banana Smoothie and save 110 calories, 10.5 grams of fat and 17 grams of sugar. The smoothie has protein powder and an actual banana in it, so you’ll stay satisfied for longer. And it tastes good, too. If you need the caffeine fix, ask them to put a shot of espresso in it. **Ask the barista what kind of milk they use in your latte. If it’s 2%, ask for 1% (if you’re not quite ready to take the leap of nonfat faith). Or try soymilk, which has less calories and fat than 2%. **Ask for half the syrup, or sugar-free syrup. **Put a package of sugar free hot chocolate in your plain coffee to mix things up. By tracking what you eat, you’ll be shocked at how many calories you’re wasting on drinks. Track everything, even if you don’t know all the nutrition info. USA Today’s food tracker is a great guide. If you haven’t joined the challenge yet, send me an email at WeighIn@captivate.com. Include a before picture, your height, weight and body measurements. (Or any combination that you’d prefer.) If you’d rather not send a before picture, still take the picture. It’ll help motivate you. And come back next week, when I share my very first "before" picture. Be afraid. Be very afraid. This entry was posted by kate, on Friday, March 19, 2010. You can leave your response .